Several years ago, I found a good way to advertise my home business. You can make your own t-shirts and wear them like a portable billboard. 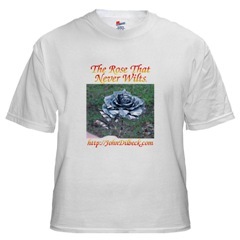 In 2000, to advertise the hand-forged steel roses I was making back then, I opened a simple, free shop at CafePress.com and created t-shirts showing The Rose That Never Wilts photos on them. I intended these designs solely for my own use, but I was surprised when a few people bought shirts with my roses on them and wore my advertising around their neighborhoods. I felt like Coca-Cola, but on a much, much smaller scale. Over time, this free shop evolved into my premium shop, John Dilbeck's Shirts, Mugs, and Hats, where I now sell dozens of designs on hundreds of products. It has evolved into a simple, mostly hands-free, residual income stream where I sell products I designed and uploaded months ago and get commission checks every month. I advertise the products and CafePress handles all the processing, printing, and delivery tasks for me. Then, I deposit the commission checks CafePress sends me. Now and then, when inspiration strikes me, I upload a few new designs and promote them here and there. Business cards are a must-have item in the guerilla marketer's arsenal of marketing and advertising tools. Money was tight a few years ago and I found a great source of high-quality, free business cards to help me market my steel roses that never wilt. I ordered some free business cards from VistaPrint and carried a few with me every time I went into town wearing one of my Steel Roses shirts. 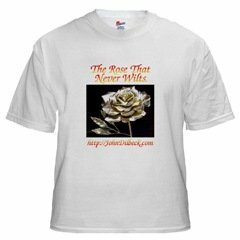 When anyone would comment on the shirt, I'd hand out a couple of my free business cards that had a nice picture of a yellow rose and the contact information so they could visit my website or contact me directly. Since the cards were free, except for postage, I handed them out to everyone and sent them to friends and prospects. I'd usually include two or three cards and request that they be passed around to others who might have been interested. This combination of marketing activities worked very well for me and I believe it can work for you, too. I still buy my business cards from VistaPrint. Just a few weeks ago, I ordered a supply of premium business cards for a new business venture and got a great buy on them by purchasing them from a special discount link. VistaPrint runs regular discount offers, so, even for the paid products, you can usually save money and not purchase them at full price. Most of the time, now, instead of getting 250 free cards, I buy premium cards by the thousands and pass them around as if they were free. Are you an artist or photographer? You can make your own t-shirts featuring your best artwork or photgraphs - and earn money when people buy them from CafePress. CafePress sets a base price for each item they supply. You can put your design on these products and you set the mark-up to make a profit on each sale. The retail price showing in your CafePress shop is the total of their base price plus your markup. Some people make the mistake of marking up a shirt only a dollar or two, but for good, unique designs, you can make more than that on each sale. I've found that I sell about the same number of products regardless of whether I mark my shirts up $5.00 or $10.00, each. Over time, I've settled on a mark-up between those two numbers and I'm enjoying increasing sales the longer my shop is online and I continue marketing it. I'm not much of an artist when it comes to graphics on t-shirts, but I've developed a line of items with stylized text sayings on them. You can make your own t-shirts with funny or wise proverbs, aphorisms, adages, maxims, epigrams, apothegms, and slogans on them. People love making a statement with their t-shirts, and you can earn good commissions if you have the knack. Sometimes, you even luck into something that you could never predict. 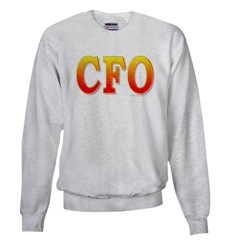 One of my best selling designs is for Chief Financial Officers (CFO). I originally created a design that said Because I'm the Mommy, That's Why!and that just cried out for a companion Because I'm the Daddy, That's Why! Both of those designs have sold well, so I went a bit crazy one day and designed dozens of other shirts using modifications of the same basic design. It was never a priority to get all the designs uploaded into the store, but I added some now and then. When I ran a sales report for the store a few days ago, I was surprised to see that the "Because I'm the CFO, That's Why!" white t-shirt was one of my best selling products. I never would have predicted that. 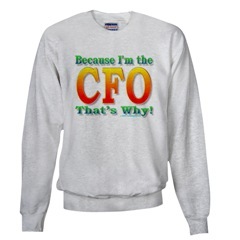 So, today, I created two new sections and added dozens of products bearing the Because I'm the CFO, That's Why! and CFO designs. Now, in addition to a single white t-shirt bearing the design, there are many other products available. Hopefully, this will result in more sales of products bearing these designs - but you never know without testing. You can make your own t-shirts with custom designs for individual customers or groups of customers and make a tidy profit. In addition to charging for your time creating the design, uploading it to CafePress, and putting it on specified products, you can earn a commission for each item that is purchased. Custom shirts for birthday parties, anniversaries, reunions, and other events are very popular. If you create a custom design for a family reunion, for example, you can let your customers purchase as many items as they want, and you'll get paid your markup on each item they buy. You can do all of this and not know anything about screen printing or any of the other technologies used to put designs on clothing and other items. You don't have to do color separations or allow for areas where inks may overlap as you would if the products were going to be screen printed. Your customers don't have to pay higher prices for full-color designs than they would for single-color prints. CafePress offers full-color printing of your designs on all their products - and that is already built into their base price for each product you sell. There is no minimum order when you make your own t-shirts at CafePress. If you're used to ordering several dozen items upfront, you may be surprised that you can order just one item at a time, if you want. You can save money if you buy more than 15 items at a time from your own store, in which case CafePress offers a discount on the base price for each item that you purchase in quantity 15 or more. Now, that doesn't apply if you buy 5 t-shirts, 5 sweatshirts, and 5 mousepads. You must buy at least 15 of a single product and all must be printed with the same design to qualify for the discount. On the other hand, you can earn more money if your customers buy lots of products from your store in one month. If you sell certain dollar amounts in a single month, you will earn bonus commissions. The more you sell, the higher the bonuses can grow. Currently, there are about 100 different items on which you can put your designs and then sell them in your shop. CafePress also offers the ability to sell print-on-demand books, data CDs, music CDs, and other digitally-created items, and more are being introduced as time goes by. If you are a musical artist or member of a musical group, you can create your own music CDs, make your own t-shirts, and sell your own bumper stickers -- all from your CafePress shop. You can open as many free shops as you want and still earn commissions from selling the designs you create and put on products at CafePress. But, there are restrictions on the free shops, or, to put it another way, the premium shops offer many more features than the basic shops. If you want to create multiple designs and sell them on many products, you will want to upgrade to a premium shop, and the cost is extremely reasonable. For example, in my premium shop at Shirts-Mugs-Hats.com, the first one or two sales I make each month pays the shop rent. All other sales that month are profit. A premium shop allows me to concentrate on one site - or I can have as many premium shops as I want if I want to pay a monthly fee for each of them - and it is easier to cross-promote between products than it is if you were to have multiple free shops. Why would you want more than one premium shop? If you have niche-oriented items, you may find that you can market your products better if you separate each niche into its own store. Or, if you're like me, you may just lump all your designs into different sections of one store. The choice is yours. Make your own t-shirts, mugs, hats, magnets, mousepads, and many other articles at CafePress. You can start immediately. If it doesn't work for you, it's easy to close your shop and do something else. Don't expect immediate sales of your products, unless you already have a built-in market, a good mailing list, or lots of visitors to your websites and blogs. It takes time to market your products and attract visitors to your shop. The more good designs you offer and the more visitors you can attract to your shop, the more products you will sell and your commission checks will grow larger in the process. Some people who work their CafePress shops full-time are earning full-time income. Others earn enough for a car payment or nice dinner on the town. Most people probably earn much less, but could improve their results with better advertising and marketing. Some designs, probably, will never sell for various reasons. Don't try to create a product and then build a market. Learn how to find a thriving market and then place your designs in their path. You'll make many more sales that way. Unless you are already skilled in the graphic arts, you will probably have to learn some basic skills before you really start making lots of sales, but even designs that I would consider primitive at best are selling on a regular basis because of good marketing to the right group of customers. You will never have a successful shop if you don't make your own t-shirt designs, open a shop, upload your designs, and start advertising them for sale. Why delay?